The Dnieper is one of the major rivers of Europe. It rises near the Russian city of Smolensk and flows into the Black Sea. 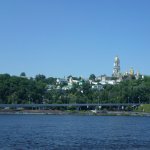 The Dnieper is the fourth river by length in Europe, its total length is about 2,287 km with a drainage basin of 504,000 sq. km. The Dnieper is noted for its hydroelectric stations and dams. As the largest part of the river (1,095 km) is within Ukraine, the Dnieper is extremely important for the country's economy. It is an important navigable waterway, and its dams generate about 12% of the country's total electricity. The Dnieper is also a very important part of Ukrainian culture. It is regarded as one of the symbols of the nation. Many geographical names in Ukraine are connected to the river. Dnieper Day was established to raise public awareness about environmental problems associated with the Dnieper. For example, intensive use of the river's water resources leads to pollution and eutrophication. The holiday is marked with cleanup activities organized by volunteer groups.